Hello! Isn't she so cute! This is one of those images that I saw, and just had to have her : ) I also had to pre-order two more Tildas. I guess I've been bitten by the Magnolia bug~ladybug that is : ) I decided to incorporate this card into a couple of challenges~Magnolialicious Highlites March Sketch Challenge, and the Roses on Paper & Belles 'n Whistles Challenge #34 to use Punches! I used my Martha Stewart heart border punch, and my EK Success Retro Flower Punches. The paper is SU Sending Love Specialty DSP. Have a fabulous evening! I'm excited for some Idol~and some Lost! AWWW Kerri Tilda is soooo super cute, wow girl your coloring is soooo beautiful!!!! You used the perfect colors for this sweetie!!! LOVE those flowers and pretty border...What a great card!! Oh Super adorable. Great heart border along the side and awesome coloring. This is super cute, hun. You colored your Tilda perfectly. And the red and pink... very nice! This is simply stunning Kerri! Love your coloring and all the details added. Thanks for playing along with us at RoP/BnW combined challenge. This is fabulous. Tilda is so cute and your colouring is brilliant. I love the pretty papers too. Oh how sweet Kerri!! love that dp and your stunning coloring of sweet Tilda!! Gorgeous layout! Gorgeous, what a lovely card. I love the colours and the cute image. I wish I knew how to use a sewing machine. 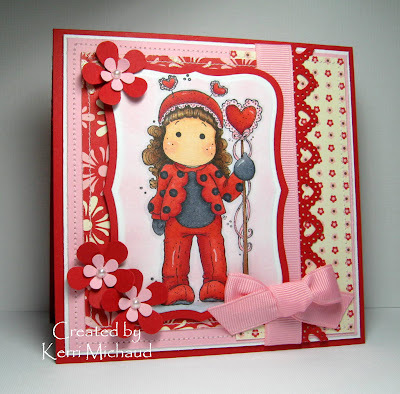 I love all the stitching you do on your cards. This card is so sweet! Dang! This is so adorable! I don't usually like these Magnolia's - they weird me out with no nose or mouth. But this card is fantastic and oh.so.cute!